The resurgences of aquafitness as a viable means of enhancing well-being is exciting and encouraging. People are filling classes, moving to music and enjoying the challenges and rewards of the aquafitness experience. The Canadian Aquafitness Leaders Alliance was founded in 1993 to meet the increasing demand for the establishment and high quality leadership in aquafitness. The CALA organization seeks to enhance aquafitness leadership through our comprehensive manuals, intensive training courses, workshops, conferences and a high certification process. CALA continues to develop leading edge programs to increase the diversity of water exercise programs. Fitness leaders, coaches and personal trainers are exploring Water Running, Aqua Kick Box, Aqua Natal, Aqua Cycling, Aqua Africana, Aqua Abdominals and many forms of Aqua Rehabilitation. These and other specialty water exercise programs are making their way into private and community based pools. CALA continues to be the front runner in researching and developing new programs. The creative spirit that drives this organization is reflected in the passion and commitment demonstrated by CALA certified leaders and trainers world wide. The Canadian Aquafitness Leaders Alliance Inc. was founded by a dynamic, passionate and dedicated individual who embodies a vision of excellence. Charlene Kopansky found a place on the Dean's Honour Roll while earning an honours degree in Biological Sciences (Human Kinetics) from the University of Guelph, in 1977. She followed this degree with a Bachelor of Education in Science and Physical and Health Education from the University of Toronto. Since 1978, Charlene's skills in dance choreography, fitness and aquafitness leadership have made her a popular presenter in Brazil, Trinidad and Tobago, Mexico, Australia, Germany, Israel, Carribean, South Africa and New Zealand. 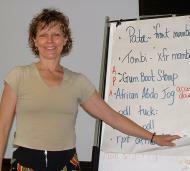 In 1996, she was awarded the prestigious 'Top Presenter' award at the Bodylife, German Convention. 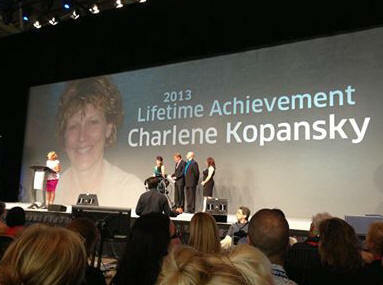 Charlene continues to be a visionary as she promotes the highest standards in the field of aquafitness leadership. Since its foundation in 1993, CALA has attracted delegates from around the world to the only national Aquafitness Convention in Canada: “CALA Exclusively Water”. CALA standards and continuing education credits (CECs) are recognized across Canada and beyond. Since 1996, CALA has offered training in aquatic therapy and now brings "The Healing Waters – Aquatic Post Rehabilitation Program" to participants and leaders across Canada and internationally with aquatic post rehabilitation training at CALA Conventions including an "Aqua Arthritis" specialty training and certification course. As we continue into the new millennium, CALA continues to grow in numbers and knowledge, because of the combined talent, drive and vision of its founder, Charlene Kopansky, and the enthusiasm and support of its members. CALA continues to develop leading edge programs to increase the diversity of water exercise programs. Fitness leaders, coaches and personal trainers are exploring Water Running, Aqua Kick Box, Aqua Natal, Aqua Muscle, Aqua Cycling, Aqua Africana, Aqua Abdominals and many forms of Aqua Rehabilitation. These and other specialty water exercise programs are making their way into private and community based pools.